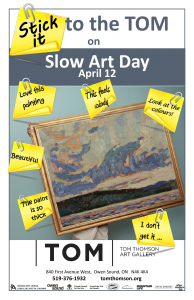 Stick It To the TOM on Slow Art Day! 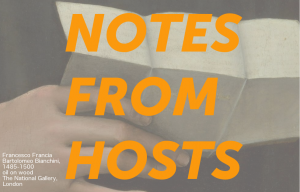 On April 12th“Stick it to the TOM on Slow Art Day” visitors will be provided with post it notes and pencils and we’ll be asking you to write down your responses to the works on view and let us know what you think of them. Following the model set up in the Convergence and Look What We Have! exhibitions, these responses will be posted on the walls next to the artworks so that other people can read and discover what moved/inspired/challenged/provoked someone else in their interaction with the art. We will also be offering a virtual platform for those who cannot physically visit the TOM on April 12th. 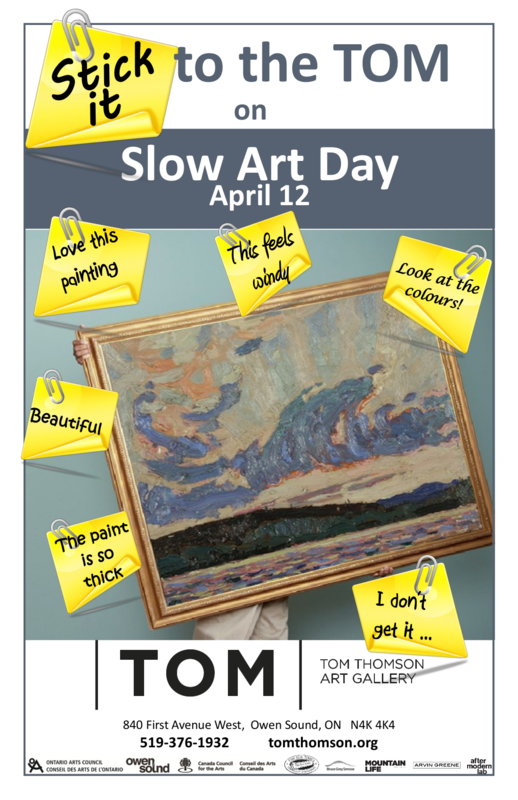 On that day we will be posting images from our collection and inviting people to “Stick it to the TOM on Slow Art Day” by posting their responses to the images on our Facebook page. We’ll be tweeting some of the post it note responses on our Twitter page with the hashtags #StickItToTheTOM and #SlowArtDay if you want to follow the dialogue there as well. The TOM is a regional art centre and INTERNATIONAL cultural attraction dedicated to the innovative spirit of landscape artist and Canadian icon, Tom Thomson. The TOM celebrates excellence in the visual arts locally, nationally and internationally, through exhibitions of historical and contemporary art, education programs and the enrichment and interpretation of its significant permanent collection. We have one of the largest collections of Tom Thomson’s work (74 pieces including artifacts), over 90 pieces by the Group of Seven, 42 pieces by world renowned photographer Edward Burtynsky as well as work by Emily Carr, John Hartman and a substantial collection of work by women and First Nation artists. We look to engage our immediate and broader audience in meaningful ways through our exhibitions and onsite and offsite programs. The TOM is the region’s main disseminator of contemporary art. Through excellent exhibitions, publications, and engaging social media platforms and education programs, the Gallery provides a unique experience for its audiences. So on April 12, come down to the Gallery or visit us online and tell us what you think! Admission to the TOM is by donation. There’s always something going on at the TOM! Sign up for this event here.